Even though the text in this picture book biography of Lois Ehlert is written for children, I really enjoyed learning about her techniques and how bits of her life are woven into her stories. Teachers will find this valuable to read to students, who are likely familiar with many of the books this biography mentions. Lois Ehlert always knew she was an artist. Her parents encouraged her from a young age by teaching her how to sew and saw wood and pound nails, and by giving her colorful art supplies. They even gave her a special spot to work that was all her own. Today, many years and many books later, Lois takes readers and aspiring artists on a delightful behind-the-scenes tour of her books and her book-making process. Part fascinating retrospective, part moving testament to the value of following your dreams, this richly illustrated picture book is sure to inspire children and adults alike to explore their own creativity. 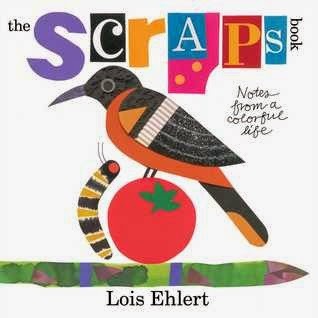 The Scraps Book by Lois Ehlert was first published in 2014 by Beach Lane Books, an imprint of Simon & Schuster. I appreciated all the hard work and persistence that goes into a single creation. It was fun to see how her life intersected with her writing. I’d love to share this book with students, and especially students who are interested in art and writing. This book shows how ideas for stories and art can come from everyday life, and some of Lois Ehlert’s process in creating a book. It's also a good way to show students how much hard work and persistence goes into a single project. As a follow up to reading this, it would be fun to try some of the techniques she used to create her collages and illustrations. Another interesting activity would be to go back and study the books she mentions. She also includes some fun art-related activities in the book. If you're looking for more great picture books to read to your class or to investigate as a writer, author Susanna Leonard Hill has a wonderful list of Perfect Picture Books. You sold me. What a fascinating choice. I think I would enjoy reading about Lois was nurtured from a young age to create. What a gift she was blessed with. Good for kids to know that famous people were kids too and had dreams just like they do. Great activities. It's definitely worth looking for! Oh, I LOVE Lois Ehlert's work! I haven't read this, and would very much like to! Thanks for sharing, Andrea! I know you will enjoy it! DEFINITELY need to read this one! Sounds absolutely fascinating. I'm like Patricia - absolutely sold me! It's worth a read, for sure. I read this book for me last year. It's a good one. Beautiful! I've always loved Lois Ehlert's books. I love Lois's art! definitely putting this one on the "read asap" list. I took this book out of the library to read to my daughter, but I think I enjoyed it as much as she did. It's a fabulous book.